Mojacar Resort The area around Mojacar Playa boasts 17 kilometres of beaches and open coves, numerous golf courses, picturesque towns and villages with white Moorish houses full of tradition, history and charm Mojacar Resort. 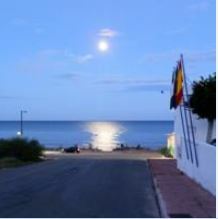 Mojacar Playa is an unspoilt resort with no high rise developments and boasting 9 km of safe European blue flag beaches. Along the beach you will find the most delightful beach bars. The resort is overlooked to the rear by the Sierra Cabrerra mountains which form a dramatic backdrop to the coastline. Mojacar Playa is in the province of Almeria in the South East of Spain and has the sunniest and driest climate in Europe, with over 300 days of sunshine a year. The area has a great variety of landscape and facilities and yet it is one of the few places on the Mediterranean where you can still find deserted beaches and countryside with no intensive tourism. Cheap flights into Almeria airport (40 mins drive) have increased considerably with Easyjet and Ryanair or alternatively it is less than 2 hours drive on the uncongested motorways from Alicante and Murcia airports. 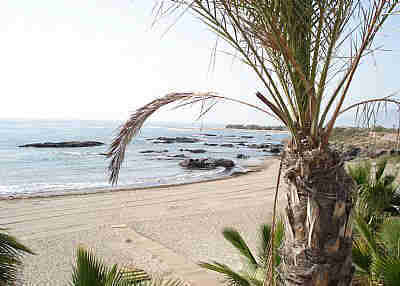 Costa Almeria’s warm and sunny coastline makes holidaying there a pleasant experience from March through to end November. Even in winter you can enjoy an average of 6 hrs sun a day with clear blue skies or for a complete change of scene drive 3 hrs inland to the Sierra Nevada and enjoy some excellent snow skiing. This environment encourages an outdoor life with plenty of scope for families, golfers, walkers tourers, those wishing to participate in water beach activities or relaxing in the nearby attractive bars and restaurants enjoying the local food and wine and watch the world go by. 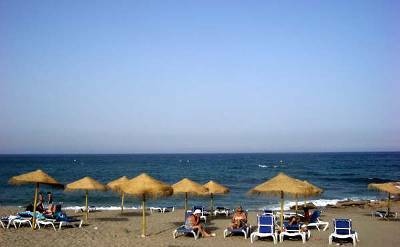 The area around Mojacar Playa boasts 17 kilometres of beaches and open coves, numerous golf courses, picturesque towns and villages with white Moorish houses full of tradition, history and charm. Modern development is being built with respect for the local environment. The area is also the most productive and fertile market garden area of the whole continent. The locals are outgoing and hospitable and ready to welcome you warmly. Most speak some English and are very patient with holiday makers trying out their language skills. It is no surprise that this area, known throughout Spain as El Rincon del Embrujo (The Corner of Enchantment) attracts quality tourists from Europe and Northern Spain looking for the real Spain with no cities or high rise developments of other resorts. Best Club Vacaciones Pueblo Indalo. Vacaciones Pueblo Indalo features charming Arabian-style architecture. Each functional Pueblo Indalo apartment has a furnished terrace, some with sea views. All apartments include a living area and a kitchenette with a fridge, oven and hob. The Best Pueblo Indalo offers a poolside bar and a buffet restaurant with show cooking. In summer, the complex also has a pizzeria, beach restaurant and an entertainment programme. Best Pueblo Indalo is situated in the Vista Los Angeles area, 2 km from Mojácar and 5 km from Marina Golf Mojácar. Buses to Mojácar stop outside the complex. Almeria Airport is just over 60 km away. Located on Mojácar’s Cantal Beach, Hotel Best Club Vacaciones Pueblo Indalo features charming Arabian-style architecture. It offers a tennis court and 2 outdoor pools, surrounded by gardens. Hotel Rooms: 586, Hotel Chain: Best Hotels. Summer at Tito’s Beach Bar on the Playa de Mojacar, southern Spain. Look in sometime you will be made Welcome at Mojacar Resort. Many of the local beaches have been awarded blue flag status which is a European quality distinction, Some are totally un-commercialised and others have bar(s) and the all important toilets. 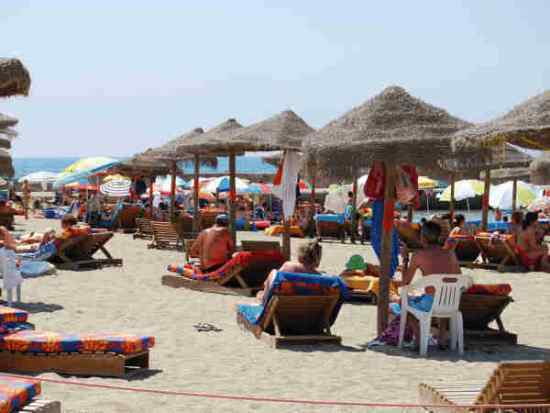 The nearest (a blue flag) beach has beautiful sand, with sunbeds and umbrellas for hire. There are also rocky coves with crystal clear water to explore within a short drive.. You can drive to and park near most beaches. For snorkling we recommend the local beach or better still Crystal beach on the road to Villaricos. Villaricos is a lovel Spanish seaside fishing village with good beaches and restaurants. 35 minutes from Mojacar is Aqua Amarga. The spectacular drive through the mountains following the coastline is worth the trip alone. Aqua Amarga has been mentioned in The Times as having one of the top ten beaches in the world. 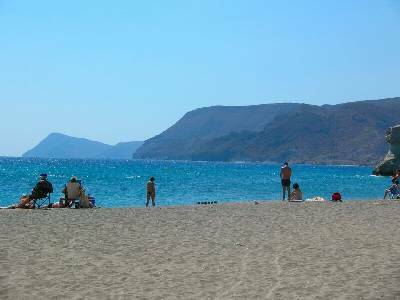 It is a beautiful beach surrounded by mountains and very quiet, with a few beach side cafes restaurants. Located on the western extreme of the Bay of Almeria the stark, volcanic hills of the Sierra del Cabo de Gata tumble down to the sparkling sea around the Cabo de Gata reserve. With just 100mm of rain a year this area is the driest in Europe but supports over 1000 varieties of animal and plant life that thrive in the arid, salty environment some unique to this area. In 1997 it was catalogued by UNESCO as a biosphere reserve indicating the level of scientific and popular interest which this territory inspires at international levels. Here you will find reefs, volcanoes, dunes, cliffs and a wide range of flora and fauna of extraordinary scientific interest, with 63 km of the best conserved Spanish Mediterranean coast. Many of the towns and beaches are well worth exploring. For those who like walking the area is still a real wilderness and you are likely to be walking in isolation amid some extraordinary scenery. Cuevas de Sorbas – Sorbas stands at the edge of a dramatic limestone gorge where water erosion over millions of years has resulted in the stunning Cuevas de Sorbas. Here with helmet and light you are guided through an amazing cave system. Allow 2 hours for this. For the fainthearted (like myself) you can wait for the explorers to return in the visitors centre which has three rooms of displays and an artificial cave. It is also possible to see cave paintings and dwellings at Cuevas de Almanzora. There is a very good water theme park in Vera, popular with children and adults alike. This is situated on the road to Villaricos less than 15 minutes from Mojacar. Situated 5 minutes from Mojacar. Drive to Garrucha and take the road towards Turre and the motorway. The Go-karts are on your right hand side and easily viewed from the road. You will probably have notied them on your way in from the airport. The semi-desert landscape resembles the American West and in the 60s and 70s many Western movies were filmed here including The Magnificent Seven, A Fistful of Dollars and The Good, the Bad and the Ugly. Three Wild West sets now remain as tourist attractions and offer a fun day out particularly for children or those of us who can remember being thrilled by the likes of Clint Eastwood, Raquel Welch and Charles Bronson. You are able to walk through the old West village, watch a re-enactment, rid in a wagon or organise horse rides through the Desert of Tabernas with a guide. The best of these, Oasys, also has interesting film and transport museums, a good Cactus Garden and a superb nature reserve. The course is on the slopes of the Cerro del mountain featuring lakes and overlooks the sea. Here there is also a golf practice range and putting green. This course is at a ‘young stage’ and at the time of writing considerable finance is being invested into this course. Valle del Este approximately 20 minutes from Mojacar is a demanding course with good panoramic views showing the contrasts of the spectacular landscape with mountains in the background. From Mojacar Resort. It is based on the golf courses in the American deserts of California and Arizona so expect to play in a natural desert landscape. Desert Springs is approximately 30 minutes from Mojacar A championship course that claims to be the only desert golf course in Europe. Expect dry riverbeds, cactus and water springs to come into play. Mojacar Resort. Cortijo Grande, a 9 hole course on the other side of Turre, is an ideal course for a lazy afternoon or for those wishing to gain more experience. Lemon and orange trees line the fairway. Playing here and then visiting the nearby town of Cabrera, a unique village in the mountains with a lovely restaurant and spectacular views, makes a very pleasant trip. TOWNS, MARKETS AND SHOPPING Mojacar Resort. The local town of Mojacar is a compact, picturesque hilltop settlement with steep gradients, narrow streets and white Moorish-style houses. At any time of the day there is always a lovely atmosphere here with plenty of restaurants, tapas bars etc. It has many little souvenir type shops and a good leather shop in the main square. Every Sunday there is a cross between a market and a car boot sale which is fun to visit and good for bargains. Good markets – a weekly general goods and food market held on a Friday morning, and a fascinating fish market on most evenings. 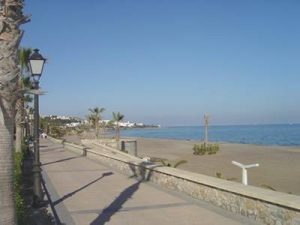 Garrucha has a long and lovely marble ballustraded promenade, where the locals gather and parade and socialise in the evening, and a good variety of shops, bars and restaurants – many, of course, specialising in fish. Nijar is a hillside village well worth a visit, though a little further away. It is a small town , well-known for producing some of Andalucia’s attractive and original pottery and colourful stripped rugs known as jarapas. The main street is lined with shops and workshops selling pottery and rugs, garden furniture, wrought iron etc. Situated 15 minutes from Mojacar, follow signs for Garrucha and Vera and then pick up signs for Villaricos. Lovely Spanish seaside fishing village with lovely beaches and restaurants. Situated 35 minutes from Mojacar on the same road as Villaricos. A larger town with a fabulous Saturday morning market situated …………………………Very good produce and lots of bargains. This is much bigger than the Friday Garrucha market. Situated 15 minutes from Mojacar, follow the signs towards Turre over the motorway and follow signs for Bedar. A lovely Spanish village in the mountains with a very good restaurant called the Miramar that has spectacular views of Mojacar Resort.